With more than a thousand confirmed planets outside of our solar system, astronomers are attempting to identify the atmospheres of these distant bodies to determine if they could possibly host life. Yet, viewing a body so far away remains a challenge. Astronomers are honing their technique in exoplanet observation with an object we know much more about in our own solar system—Saturn's moon, Titan. The process should help scientists better understand what a signal from a hazy planet that is similar to Titan would look like. One of the problems with reading signals from the atmosphere on other planets is the difficulty in sorting out the differences between a thick cloud of smog-like haze from pockets of gas. At the same time, observers must contend with what astronomers call noise, extraneous signals not related to the planet they are studying. Whether it comes from material the light encounters along the way from the planet to Earth or from mechanical issues with the instruments, noise serves as static that may blur the actual readings. "Observers struggle with trying to distinguish haze signals from gas signals from noise," Tyler Robinson, of NASA Ames Research Center, told Astrobiology Magazine by email. Robinson served as lead author on a study that used NASA's Cassini spacecraft to examine Titan in a new way. His results were published in the journal Proceedings of the National Academy of Sciences and presented at the winter meeting of the American Astronomical Society in Seattle, Washington. "We've provided an almost noise-free dataset to help exoplanet observers better interpret their observations." As a distant planet passes in front of its star, light passes through the atmosphere. By studying that passage with a variety of wavelengths using a method known as transit spectroscopy, scientists can see how the signal changes with each observation and determine the composition of the atmosphere. Some planets have returned featureless readings, with no signs indicating atmospheric composition. To scientists, this suggests a high layer of clouds, or haze, in the atmosphere that absorbs the light from the star, blocking readings of the lower atmosphere that can tell scientists more about the planet's atmosphere and its potential habitability. 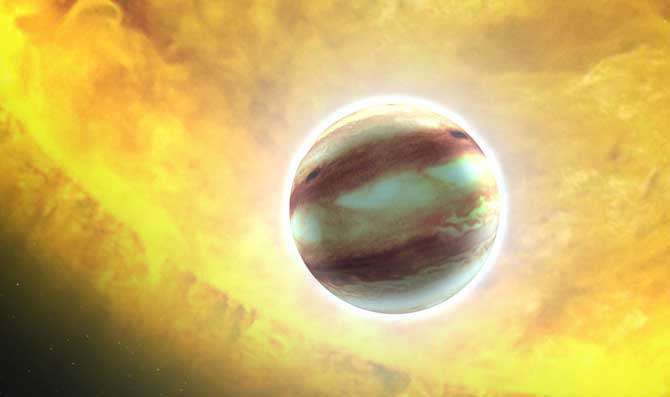 "There is no problem detecting high-altitude cloud layers in the atmospheres of exoplanets—in fact they're usually quite obvious," Heather Knutson of the California Institute of Technology told Astrobiology Magazine. Knutson, who was not involved in the research, studies the physics and chemistry of exoplanet atmospheres. "The real problem is that these cloud layers are hiding the atmospheric absorption signals we are trying to measure. In some cases, high-altitude clouds can make a small planet with a puffy, hydrogen-rich atmosphere look like it has a much more compact atmosphere made of heavier gasses, such as water or carbon dioxide." To understand how high-altitude hazes can affect the passage of light through the atmosphere, Robinson and his team used the spacecraft Cassini-Huygens to study Saturn's moon, Titan. Using Cassini, they observed the Sun rising and setting through the moon's atmosphere, a process known as occultation. For this setup, the spacecraft is located fairly close to the moon, while the source of light—the Sun—was relatively far away. 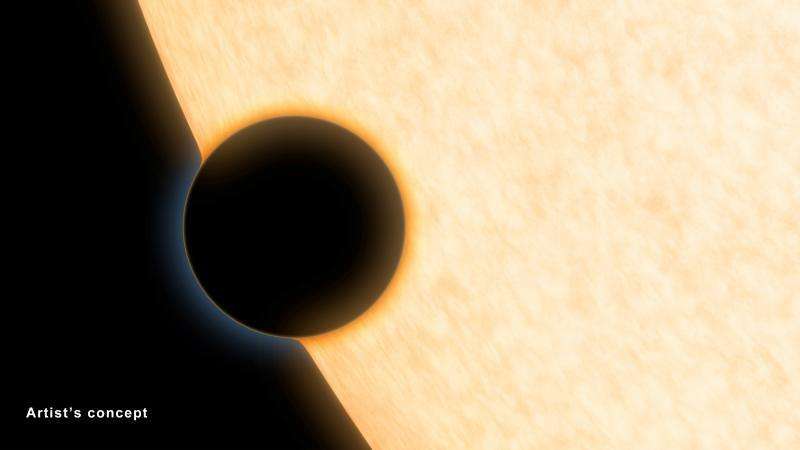 For exoplanet studies, the situation is reversed. The host star is relatively close to the planet, while observers on Earth are far away from the system. "Occultations in the Solar System and in the transits of exoplanets are perfectly complementary," Robinson said. "In both cases, the light that is transmitted through the atmosphere carries with it the spectral signatures of whatever gases, hazes, and clouds might be present in the planet's atmosphere." Saturn's moon Titan makes a perfect target for understanding hazy worlds. The satellite is the haziest body in the Solar System, with a nitrogen-rich upper atmosphere and clouds of methane that rain down on the surface of the planet. "Although other Solar System bodies have photochemical hazes, Titan is a great example of a body whose observable atmosphere is dominated by hazes," Knutson said. "It's also a nice object to study because it has a solid surface and a relatively thin atmosphere, and therefore might be a good analogue for a terrestrial exoplanet with a photochemical haze layer." The team found that the haze did a better job of blocking out blue light than red, rather than blocking all light equally as hazes were assumed to do. This means that exoplanets which were assumed to have Titan-like hazes but returned flat, featureless spectra actually have atmospheres dissimilar to that of Saturn's moon. 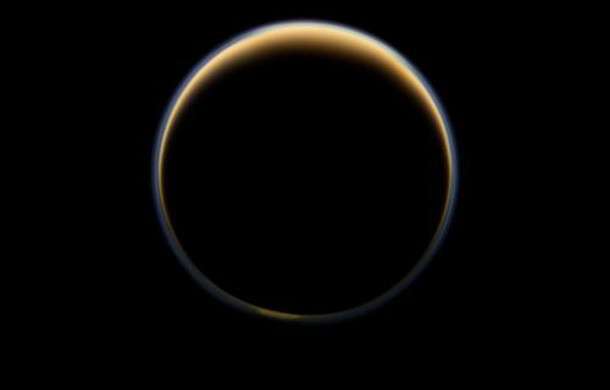 "For the worlds where our current best explanation for their flat spectra is a planet-wide haze layer, though, our observations show that Titan's haze isn't a good analogy for whatever makes up the haze on these distant worlds," Robinson said. "Some other kind of haze, with different properties for interacting with light, could explain the flat spectrum." The Solar System is filled with many types of worlds, and scientists have used them in the past to attempt to understand exoplanets. Frequently, however, they have done so by modeling the planets from a great distance, so that it appears only as a small point of light. This method models how more exoplanets may be studied in the future, using a method known as direct imaging. Although most exoplanets today are studied using transit spectroscopy, no one had previously observed the transit spectra of Solar System objects as points of comparison.Titan may be the best solar system example of a hazy body, but other worlds can offer insight into the variety of exoplanets scientists are likely to discover. "Most Solar System worlds have clouds or hazes of some types in their atmosphere," Robinson said. "By studying occultations—by, say, Venus or Saturn's atmosphere—in the Solar System, we have an exciting opportunity to explore the variety of ways hazes and clouds can sculpt transit spectra."